Gene Rogovitz created his stark "infographic" series as an homage to well-known objects. Inspired by how vintage encyclopedia graphics achieve the maximum visual impact with deceptively simple and minimalist layouts, artist Gene Rogovitz created his stark "info-graphic" series as an homage to these bygone books and well-known objects. This beachy print is doubly nostalgic as it also captures the excitement the artist felt when he received his first surfboard at just 7 years old. Like an artifact displayed in a museum, Rogovitz memorializes these water-bound wonders in his punchy print that is filled with facts about the surfboard's first appearance and the history of the design. 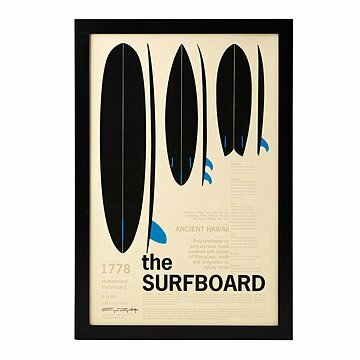 With timeless graphic appeal and a slick aesthetic, this print will brighten up the home of your favorite wave chaser. Designed and printed on Long Island, New York. For more prints in this series, check out The Skateboard, The Bicycle and The LP. Great gift for a surfer! I bought this because I wanted a unique gift for my 50-year-old cousin. I felt it would make a nice item for his recently remodeled home. He loved it! I also bought the skateboard print because I couldn't decide between the two of them. They made a nice set! I really like it, looks better than in the picture.